The economic census of India is a remarkable document, not so much for figuring out how many new jobs are being created as for holding up a mirror to employment conditions in the country. Take the latest economic census, the sixth one, the provisional results of which were made public recently. The census looks at economic activities, not by enterprises, but by “establishments". An establishment is defined as “an enterprise or part of an enterprise that is situated in a single location in which one or predominantly one kind of economic activity is carried out". All establishments in the country engaged in activities apart from farming, plantation, public administration, defence and household work including as maids, drivers and other domestic workers are included in the census. Here’s one of the most important findings: a fifth of the establishments fall in the category of “outside household without fixed structure". That means a fifth of the employment in the country is in “establishments" that have no fixed structure. All you probably need to qualify as an “establishment" is to have a sheet spread out on the street on which to lay out your wares. This type of business seems to be growing rapidly: in 2005, at the time of the Fifth Economic Census, the number of establishments working without premises constituted 18% of the total number of establishments; by 2013, they were 20.49% of total establishments. In 2013, another 38.39% of all establishments were “inside household", which means they operated from within residential premises. Only a minority of establishments, 41.13% to be exact, were classified as “outside household with fixed structure". So the most basic fact about the Indian economy is that almost three-fifths of its enterprises operate either out of home or without a fixed structure. It’s a stark reminder of just how informal the economy really is, how the vast majority manage to scrape out a living. To take another yardstick, the proportion of hired workers in total employment is less than half. The 2013 economic census says, in rather convoluted phraseology, that 39.53% of the total number of persons employed are “not-hired males", while 14.78% are “not-hired females". In other words, 54.31% are self-employed. That is not surprising, considering the proliferation of household employment and hawkers. In the 2005 economic census, 46.1% of workers were self-employed, or “own account workers". We can now make sense of the finding that the maximum growth in employment between 2005 and 2013 has occurred in Manipur, an insurgency-wracked state where the writ of the state government is severely limited outside a few towns. 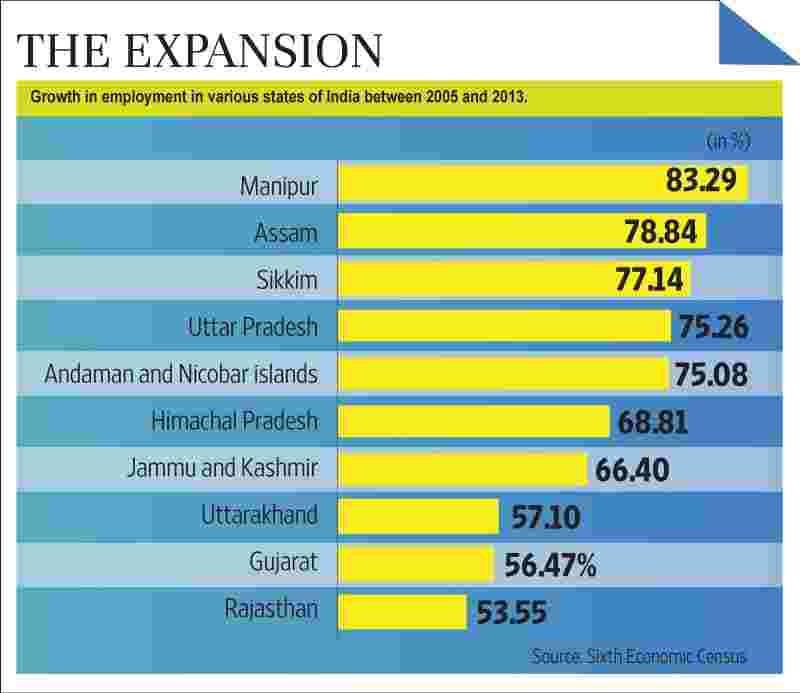 The census tells us that employment went up by 83.29% in Manipur between 2005 and 2013. Assam was second, with employment growing by 78.84%, Sikkim third, followed by Uttar Pradesh and the Andaman and Nicobar islands. None of these places is a paragon of economic growth and most of them labour under well-known disadvantages. All that the growth in employment in these places tells us is that the quality of employment is very low. Manipur, for example, has 34.5% of its establishments “outside household without fixed structure". Another 45.2% are located within households. Clearly, people desperate to eke out a living have been hawking a few bananas at street corners, or trying to earn some money by repairing a few shoes and have, in this way, contributed to the growth in employment. The average number of persons per establishment is 2.18, according to the 2013 census. Enterprises are getting smaller and smaller and average employment per establishment has steadily come down from 2.88 in 1990 to 2.75 in 1998, further to 2.41 in 2005 and now to 2.18. The 2013 provisional data does not make a mention of the number of establishments that employ more than 10 persons, but in 2005 it was a minuscule 1.51% of total establishments. In that year, the data also showed that average employment, per manufacturing establishment with hired workers, was a mere 5.56 persons. Because the size of the vast majority of firms is so small, they are unable to reap economies of scale. Small firms find it difficult to secure funds, nor do they have the resources to upgrade their technology. Their productivity accordingly remains very low. They also pay very low wages and the work conditions are terrible. Little attention is paid to workers’ safety. And finally, the small size of firms affects the competitiveness of Indian business vis-à-vis competitors. The challenge in India is not only to create jobs, but to increase the scope for formal employment. Much of the employment generated shown by the economic census is not employment at all, but a desperate attempt to survive. Development has always led to a movement of people out of farming into the manufacturing and services sectors. But jobs in the formal sector are few and the result is dead-end jobs requiring little or no skills. The way out is to increase the scope for formal employment, by scrapping labour laws that benefit nobody apart from a privileged labour elite.